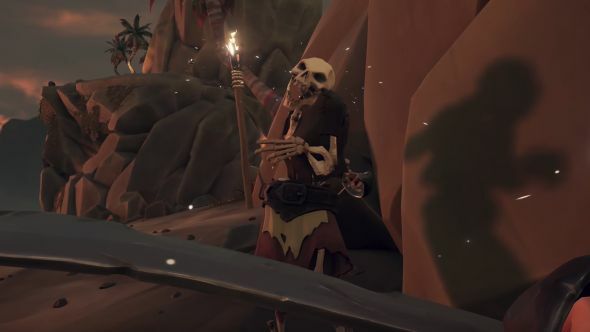 Since they were introduced into Sea of Thieves in February 2017, during development, the skeletons of the game have been slowly upgraded bit by bit. In an interview on YouTube, two of the developers (Sarah Noonan, software engineer, and Andrew Preston, senior designer) have gone into how the skeletons have changed to make them a real undead pirate threat. In case you want a co-op game to play now, probably without skeletons, here’s the best co-op games on PC. The biggest, and strangest, part of that is the levels of perception Sea of Thieves’ skeletons have. They can hear a cannon in the distance and become curious, or when they’re damaged they’ll turn around and search for you rather than instantly knowing your exact location. Of course, how a skeleton, an undead pile of bones without eyeballs, ears, or any living tissue, can hear or see you is another matter entirely. Sea of Thieves’ skeletons don’t even have anything resembling ears! Since they were first added, the skeletons have been given new animations for when they’re hit, new weapons to give them something resembling a progression system in terms of difficulty, and attributes to determine accuracy among other things. The full interview can be watched above, for more on exactly how the developers have grown the skeletons from being a wandering menace to an undead threat. Also, one of the developers has a Lego skeleton on top of their monitor, which is quite cute.